BC34 - 5.0 X 3.2 X 1.0 mm. 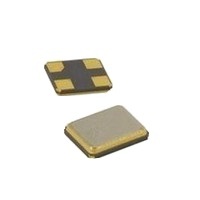 The BC34 series is an ultra miniature surface mount (SMD) type crystal measuring 5.0x3.2x1.0 mm. Its low profile allows for ease in circuit design. The ceramic base and metal cover provides the durability and reliability necessary for many different applications including bluetooth, mobile phones, USB interface cards, and wireless communications.